Q. Can anyone start adding activities to Exhaust? As long as you have a live Steemit Account, you can create a login and start posting activities in Exhaust. If you have a Steemit Account, go to the following URL https://xhaust.me/. Exhaust will use SteemConnect to connect your Steemit account with Exhaust. You may need to provide your Steem Posting Key to approve the connection. Q. I don’t have a Steemit Account, so how can I set that up? Go to the following URL https://signup.steemit.com/ and you can sign up for an account on Steemit. Once you have been approved, you can then come back to Exhaust and get started. Once @exhaust has enough SteemPower to claim and create accounts, there will be the ability to create accounts within the site. Q. What’s the deal with Exhaust, and why should I use it? Good question, it’s a way to encourage people to get fit and active as well as help people who want to post to Steemit. 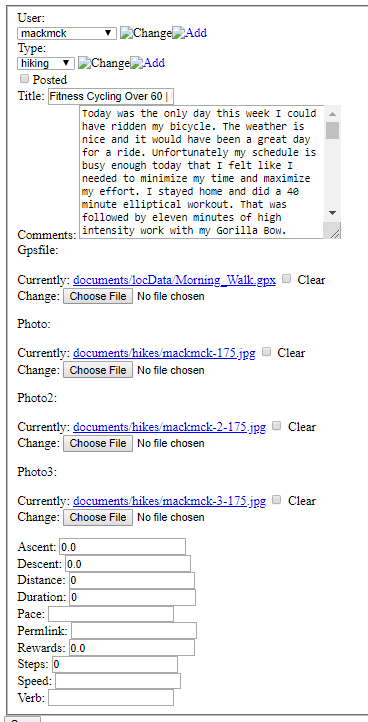 It gives them an easier way to log posts about their fitness activities. You not only get rewarded for the posts you make as part of Steemit, but your fitness activities will also be rewarded with extra SBD. Q. Can I log any fitness activity? For now Exhaust can track Cycling, Running and Hiking, but there may be plans to expand this across more sports, such as rock-climbing, surfing, and yoga in the near future!. Q. How can I log a fitness activity? Once logged into Exhaust, click on the Dashboard option at the top of the button at the middle of the screen and it will take you to the main Exhaust Dashboard for your account. From there if you hover over the Upload button at the top of the screen, you can then select New Run, New Bike Ride or New Hike. Alternatively, once you are logged into Exhaust, you can click on the following links for each activity type: Cycle: https://xhaust.me/new/cycle Run: https://xhaust.me/new/run Hike: https://xhaust.me/new/hike From there, you can either fill in all the details you need to add in your activity. Make note, you can also add in your GPS files in the form of GPX or TCX formats instead of needing to add the time, distance details manually. Then click on the Upload button at the bottom of the screen to create your new post. Q. What other things can I see with the Exhaust website? Click on the Home button to get back to the main screen you accessed when you logged in. You can also scroll down to the bottom of the Home screen to see fitness related posts from other authors around the Steem Ecosystem. The Explore button lets you check the leaderboards for each activity type, while the Feed button will show you all the recent activity posts from other Exhaust users. The Dashboard button allows you to make posts and gives you summaries of your activity posts, as well as your Steem wallet as seen from the Steemit.com website. Q. Can I edit my post after I have submitted it? No problem, if you have made a mistake, need to change something or would like to add some extra information, go to your Steemit account feed and you will be able to see it in your queue, for example; https://steemit.com/@steemusername. From there you can edit as you normally would. Soon, this feature will be available within Exhaust. Q. How can I add more tags to my posts? Exhaust will add some basic tags to your post to get you started, but if you also want to tag your post so it can be added to a specific Steemit curation trail, there is also extra tags you can add, by editing your post as we mentioned previously. Again, this feature will be added to Exhaust soon. Q. How does Exhaust earn Steem to reward its users? Exhaust gets a 20% beneficiary reward on posts, and a 5% beneficiary reward of comments created through the EXHAUST.me site. The more users Exhaust can get, the more people there will be to contribute to the Exhaust reward pool at the end of the week. Liquid rewards from posts / comments / newsletters / updates by @exhaust go directly into the reward pool for all active users, regardless of the type of activities posted. Q. What kind of rewards does Exhaust give me as a user? The liquid rewards earned by @exhaust, as described in the question above, are redistributed to all active users, currently as SBD's (a token intended to be worth ~$1 USD of STEEM) at approximately 10AM PST every Sunday. Each member is awarded their share proportionally to how far they have run, biked or hiked. So the more active you are, the more chance there is to earn more rewards. Q. It’s easier to cycle more kilometers than run or hike, will this mean I have a better chance to get more rewards? Q. When will I get rewarded for my activity? At the end of each week (Sunday, at 10AM Pacific Standard Time), all liquid rewards earned by @exhaust get distributed to users. Q. How will I get rewarded? You will be able to see your reward added to your Steemit account on the Transfers/Wallet page at https://steemit.com/@steemusername/transfers. You will see an amount of SBD received from exhaust with a description of the rewards for your running, cycling and hiking. Q. Is there a way I can help Exhaust become even better? Q. Why should I comment through Exhaust rather than Steemit or my other favorite front-end? Currently, Exhaust gives a 100% upvote (mostly to ensure that our SP isn't sitting idly -- this vote-weight will likely be decreased in the near future) worth a whopping $0.02 SBD to all comments posted through Exhaust. Keep in mind that abusers will be found quickly and scolded harshly. Q. Is there a way to invest / delegate to Exhaust? Yes there certainly is -- but be advised that there is no mechanism yet to reward investors yet -- but soon! We're working on an automated system to pay out to delegators. Updates on that should be coming in the next couple of weeks, and hope to have it ready some time in December 2018. We have included links below if you wish to delegate to our project, and help reward users for being active! All delegation links work via SteemConnect and are safe to use. Huge thanks to @run.vince.run for putting this list together! You the man, @run.vince.run! I'll figure out a way to give you a little kick-back for this. https://steemitimages.com/60x70/http://steemitboard.com/@exhaust/commented.png?201811162315 You got more than 50 replies. Your next target is to reach 100 replies. Ok @mstafford , I like how you are improving the site man!!! In particular the historical data despite there must be an error because I have never get an average pace slower than 6.5 min/km (LOL). I would like to read about your invest/delegate program as well and so delegate some SP to the cause. Starting from today I am going to post my daily run using the https://xhaust.me/ . Upvoted and resteemed. Steem applications with the real world influence are so important. Good work! I have tried repeatedly to add a workout today. Just keep getting an error page when I hit upload.